Interested in selling Stained Glass Stickers™ in your store? Click here! 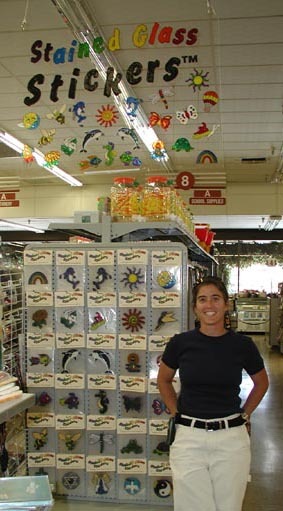 Dori Friedman is the creative force behind STAINED GLASS STICKERS™. While art has always played an important role in Dori’s life, STAINED GLASS STICKERS™ began as a hobby. Several years ago, Dori began experimenting with a variety of materials to decorate a mirror. It was at that time she discovered the special formula she uses today in each STAINED GLASS STICKER™. Dori has perfected her craft, designing numerous pieces, and now her STAINED GLASS STICKERS™ are enjoyed by thousands of people of all ages. "STAINED GLASS STICKERS™ bring something unique, clever, and beautiful into the world," says Dori. "I believe the energy I put into each creation will inspire imagination in others." To create decorative works that inspire energy and spirit. Each handmade piece combines quality craftsmanship with vibrant colors and distinct shapes, unique materials, and creative designs. Products from DORF Creations™ include its signature STAINED GLASS STICKERS™, mirrors, picture frames, original photography, and more. Copyright © 2001-2016 DORF Creations™. All rights reserved.